Yuli Gurriel (1B-HOU) went 3-4 with a pair of homers and seven RBI against the Angels on Friday night. He's now batting .283 with a dozen longballs, 81 RBI, 65 runs scored, and a handful of stolen bases across 544 plate appearances this season. While Gurriel doesn't walk much (4.2% this year, 4% career), he also doesn't whiff often (11% this season, 10.8% career). The 34 year-old doesn't make tons of hard contact (31.3%) and hits a fair amount of balls in play on the ground (45.5%), which together suppresses his power output. 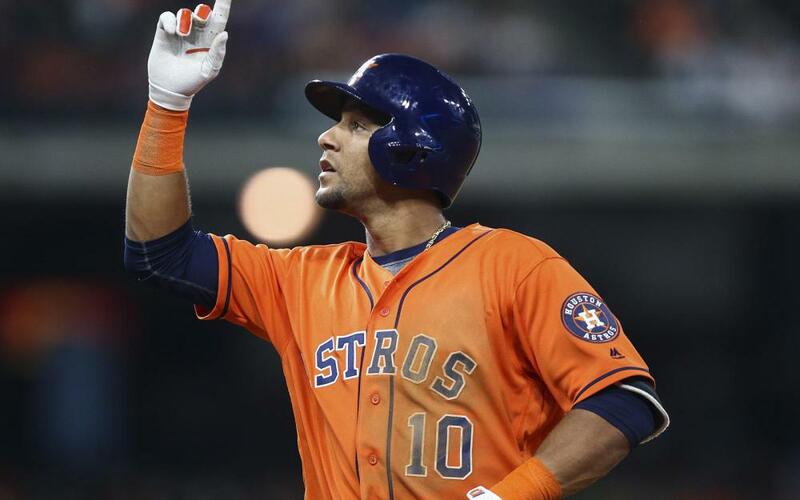 As he wraps up his second full season of big-league ball and is now in his mid-30s, it's pretty clear to fantasy owners what Gurriel is - a first baseman who hits for a solid average but offers modest pop. Despite the lineup around him, it appears that Gurriel is little more than a fringe CI option in most fantasy leagues going forward. Lourdes Gurriel, Jr. (SS-TOR) went 3-4 with a pair of solo home runs against the Rays on Friday. Over the last eight games, he is batting .353 (12-34) with three homers, eight RBI, and five runs scored. Overall this season, his batting average sits at .294 and he's hit 11 homers, driven in 34 runs, and scored 30 runs over 254 plate appearances. The 24 year-old only spent 2017 and part of 2018 in the minors, so we don't have a lot to work with to see what he might be. That small sample size does indicate that he's allergic to taking a walk (3.5% in the majors, 2.6% to 5.4% in the minors) and should post a strikeout rate lower than his current 21.7% clip (his strikeout rate was 21.8% in Triple-A this year, but 18.8% and lower at the lower levels). Although he has logged a modest 30.4% hard-hit rate, he ropes a fair amount of liners (24.9%) and isn't adverse to hitting to the opposite field (29.3%). Based on what we've seen so far from him, I wouldn't be surprised if he was a solid if unspectacular option at 2B next year if he claims a full-time gig - he should hit for a solid average and provide a little pop. Cedric Mullins (OF-BAL) continued his fine MLB debut by going 2-4 with a walk, two runs scored, and a stolen base against the Yankees on Friday. He's now batting .275 with four homers, 10 RBI, and two stolen bases as he's primarily hit out of the leadoff spot over his 149 plate appearances in the majors. The 23 year-old switch hitter takes walks at a 9.7% clip and has struck out 17.4% of the time, getting on base at a .354 clip. He possesses more speed on the basepaths than he's shown in the majors to date, as he swiped 21 bags across Double-A and Triple-A earlier this season, and he stole 30 in High-A back in 2016. Although he's never hit for a lot of power, he did hit 14 in High-A in 2016, 13 in Double-A in 2017, and 11 across Double-A and Triple-A this season. Unfortunately, he's logged a 26.2% hard-hit rate in the majors this season, as well as a 52.1% groundball rate. Based on his body of work to date in the minors and majors, Mullins looks like a .275 hitter who could regularly swat a dozen or so homers and swipe about 20 or so bags. Fortunately, he should have plenty of opportunity to carve out a permanent role on a rebuilding Orioles team; unfortunately, that team context means depressed counting stats. I'll be considering him with late-round picks in 2019. Reynaldo Lopez (SP-CHW) gave up five hits and walked none while striking out eight in holding the Cubs to a lone run over seven innings pitched on Friday. The 24 year-old's third season in the majors has been a rollercoaster ride, and he now boasts a 3.94 ERA and 1.26 WHIP over 182.2 innings pitched on the year. After struggling through July (7.39 ERA and 5.92 xFIP over 28 IP), he improved in August (4.28 ERA and 4.50 xFIP over 33.2 IP), and has been very good in September (0.45 ERA and 3.86 xFIP over 20 IP). A huge red flag in his profile is his 5.18 xFIP, which points to considerable luck suppressing his ERA. Indeed, opposing batters have mustered a mere .261 BABIP against Lopez, and he's managed to strand 75.2% of runners while maintaining a low strikeout rate of 7.19 per nine as well as a high walk rate of 3.45 per nine. So while the ERA isn't at all bad and as encouraging as this outing against the Cubs might have been, Lopez's peripherals suggest that fantasy owners shouldn't overrate him in 2019 drafts. Sean Reid-Foley (SP-TOR) struggled against the Rays on Friday, lasting just four innings in which he allowed four runs (two earned) on six hits and four walks while fanning five. His ERA now sits at a bloated 5.40 across 30 innings pitched in the majors this season, although his 4.44 xFIP suggests that he hasn't been that bad. As he has throughout his minor-league career, Reid-Foley fans plenty of batters (11.10 K/9) and he's surrendered a .324 BABIP to opposing batters while posting an inflated 1.80 HR/9 (which rides on a 20% FB/HR clip). His biggest flaw is his control, as he now has a putrid 6.00 BB/9 in the majors this season; he posted a more palatable 3.16 BB/9 over 85.1 Triple-A innings this year, although his 4.06 BB/9 across 44.1 Double-A innings prior to that suggests that control is an ongoing concern here; he posted a 3.60 BB/9 across 132.2 Double-A innings in 2017. So while the strikeout stuff is there and he certainly has the potential to be at least a mid-rotation arm in fantasy, Reid-Foley will have to harness his stuff for that to happen.